Title [Ingleside Girl Scout Mothers Club] [graphic]. Notes Donor description: Circa 1960. Ingleside Girl Scout Mothers Club. Left to right: Lois, Audrey, Dolores, Unknown, Marjorie, Imogene, Mabel, Donor, Betty. Group was formed after first Girl Scout Troop in Ingleside. 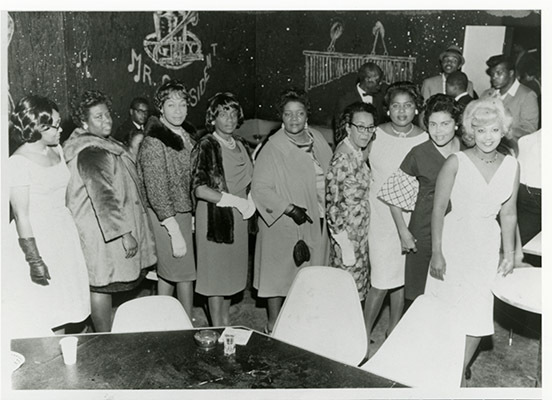 Mothers Club remained in operation as a community group from 1959-1989. Photo taken at Sam Jordan's 3rd Street. On back, "photos by the Butchertown Master - Sam Black X - 4004 3rd Street. Subject African Americans -- California -- San Francisco. Associations -- Ingleside Girl Scout Mothers Club.